Tests aimed at local or regional avalanche forecast. 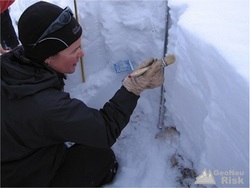 They provide a complete scanning of snowpack and allow to analyse its stability. Resistance is measured all through the snowpack depth, and once layers are identified, dimensions and grain shape, hardness, humidity, density and temperature are ascertained. This information is very useful to quantify water resources stored in snow. 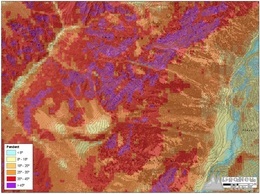 Terrain analysis technique using aerial images. By comparing images of different periods (orthoimages, stereoscopic photographs and 3D images) landscape variations, specific morphologies, instability evidence, damage, etc, are identified. These will be used in subsequent detail mapping in the field. 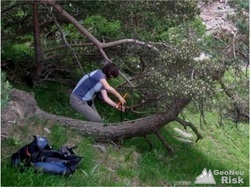 A quality photointerpretation job allows optimazing the ensuing fieldwork. To have accurate information about facts that generate geological and nivological hazard, as well as information about the events that have taken place, on-the-ground work is required. In the field we elucidate forms and we map them, we obtain samples and characterise materials, we take measurements of the events that have occurred and we characterise them. When continuous monitoring is required, we install in situ sensors, which must be periodically downloaded or which transmit send data, allowing a real-time surveillance. Where there is forest, information on the magnitude and frequency of a certain phenomenon can be obtained from the analysis of tree rings. 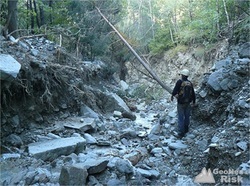 This is applicable to a variety of geomorphological processes: snow avalanches, landslides, terrain deformations, rockfalls, freshets and torrential floods, floodings, etc. Sometimes it is even possible to determine full extent of past episodes, which can happen again, representing a latent threat to infrastructures, communication routes and houses. By handling data obtained in the field, manually or automatically using instrumentation, we acquire final values or values to feed models that allow us to simulate the performance of phenomena causing the hazard. Data processing and subsequent analysis is essential to deliver a good diagnosis. 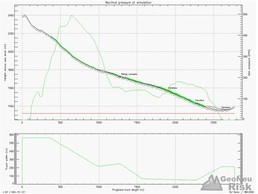 Modelling allows to calculate the magnitude of a phenomenon in relation to a return period of reference. 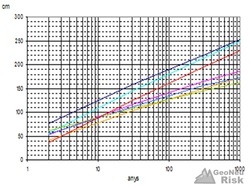 From numerical simulations we obtain parameters such as range, flow height, trajectory, speed or energy according to probable scenarios. Nevertheless it is necessary to contrast results with an adequate characterisation of the study zone and with known events. Depending on working scale and requirements, we use models with different degrees of complexity. Obtained parameters are useful for territory management at the levels of prevention and protection, and to dimension works to carry out. 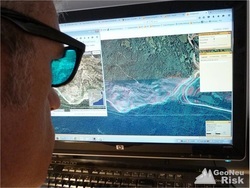 GIS (Geographical Information System) permits integrating, handling and treating cartographic information that has been acquired on the ground, and to develop products which will help us to interprete it spatially. GIS tools help us to capture information in the field in a geo-referenced way, to store, visualize, handle, interprete and present it graphically with the aim to facilitate comprehension of the obtained results.